With the recent announcement that HMV has gone into administration many people have been reminiscing about their memories of record shops. Undoubtedly my teenage years in particular were hugely influenced by record shops and music. The first LP that I bought beautifully illustrates my ongoing preference for something a little bit removed from the mainstream. I had to order it specially from the record department of Graham & Morton’s department store in Stirling. I had first been drawn to the band by hearing them played by John Peel. 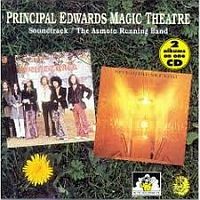 The record in question still takes pride of place in my collection – ‘Soundtrack’ by Principal Edwards Magic Theatre was released by Dandelion, John Peel’s own label. The first album was produced by the band in collaboration with John Peel; it might be named ‘Soundtrack’ but you will have to use your imagination to make up for the lack of any actual movie, something that I certainly have found easy to do over the years. I’ll nail my colours to the mast now and state that the cover photo of the band, which extends over both halves of the gate-fold sleeve, provides a fairly accurate representation of my friendship group around that time. I was thrilled to discover that they were to headline in the Albert Halls in Stirling, supported by fledgling bands Hawkwind and Supertramp (but that is a story that I’ll reserve for another time). It was such a joy to attend that night; fond memories of that experience have remained with me ever since. I feel so lucky to be able to savour these memories of a performance by such an exceptionally talented and idiosyncratic band. Perhaps I am biased, but I still take great pleasure in revisiting this and the second album, which I find still sounds fresh and unique. Each track stands on its own and spans a wide range of musical styles. Side one opens with the sound of an alarm clock as ‘Enigmatic Insomniac Machine introduces a mix of acoustic and electric sounds and rhythms along with the divinely captivating clarity of Vivienne McAuliffe’s vocals. This leads into the darkly theatrical ‘Sacrifice’ which leans towards ‘prog rock’ with powerful rock guitar; the side closes with the thirteen minute long epic tale about ‘The Death Of Don Quixote’. As I am familiar with this on vinyl, the end of ‘Don Quixote’ requires it to be turned over for another for the start of another engaging musical journey. The theatrical delivery continues with a bit of William Shakespeare, as his ‘Third Sonnet To Sundry Notes Of Music’ are sung accompanied by an instrumental backing. A brief acoustic ode ‘To A Broken Guitar’ follows before the final extended offering of ‘Pinky: A Mystery Cycle’. I am particularly drawn to PEMT because their music is so diverse; having been lucky enough to see them live once I also have some evidence of the way in which their performance was enhanced on stage with the addition of lighting, costumes and dancing. One of the beauties of music is that it is possible to mentally interact with the audio, and augment that with images conjured up inside the head. Of course, this is not something that is restricted to bands such as PEMT, it is equally possible to benefit in a similar way when listening to other musical styles that provide less diversity. Produced by Pink Floyd’s Nick Mason, ‘The Asmoto Running Band’ absolutely provides content to justify and underscore the use of ‘theatre’ in the band’s name. At one point an MC can be heard, something that still conjures up an image in my head of a ring master wearing top hat, tail coat, tights and riding boots, complete with a twirly moustache. In contrast to the depiction of so many band members in all their sartorial glory on the cover of ‘Soundtrack’, this album sleeve (designed by Hipgnosis) includes only a single enigmatic and unidentified lady in a fairly featureless corridor. Side one of this album is named ‘The Asmoto Side’ and sets out a suite of songs that comment on the contrasts between those who would like to enjoy and appreciate the wonders of the rural landscape (gone today), being displaced by the spreading impact of construction and civil engineering projects, particularly as exemplified by The McAlpine Group (here today). Side two includes a song named after one of the ingredients in packets of instant mashed potato (‘Total Glycerol Esther’), a social commentary on life in the Northamptonshire town of Kettering, and the absolutely beautiful ‘Freef (R’) All’ – if nothing else by PEMT is heard I would certainly urge this to be given a go. I have listened to both of these albums regularly, if not intensely, over the years since first getting them and I have never regretted purchasing them. Revisiting them recently in order to prepare this appreciation has been a real pleasure; in many ways their unique variety of content could almost be a microcosmic overview of my general musical tastes – something a little bit different that spans a wide range of styles without taking itself too seriously. Thankfully, both albums along with a couple of ‘extra’ tracks are now available for download on i-tunes – not the same as owning the original vinyls with their wonderful sleeves – but it does provide easy access for anybody who is interested.